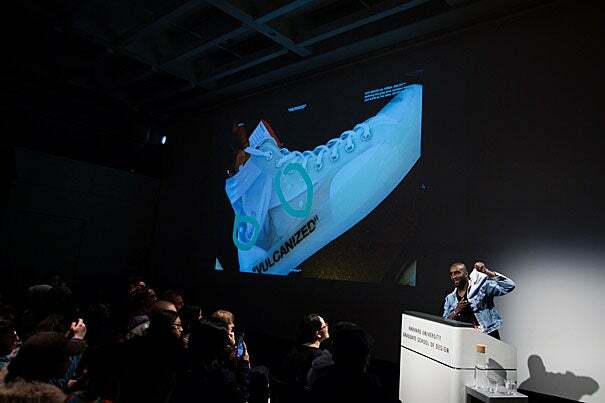 American creative designer, DJ, and founder of Off-White Virgil Abloh (left) delivers his lecture “Insert Complex Title Here,” encouraging the audience to find their own creative voices. It was probably the first time a Harvard lecture ended with audience members tossing their sneakers toward the podium. 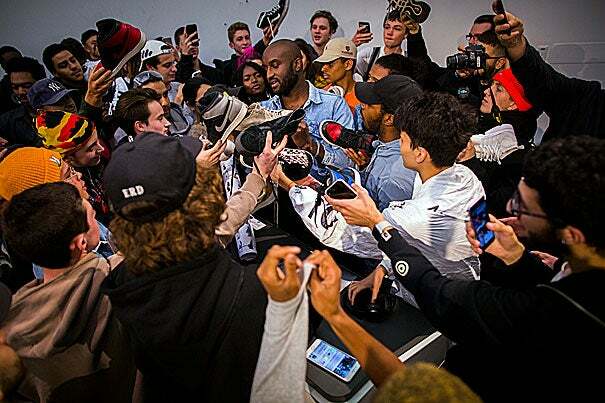 The unusual autograph session capped designer Virgil Abloh’s hourlong talk Thursday at the Graduate School of Design (GSD), which mirrored his multiplatform career: bold, dynamic, and audacious. Abloh, who founded the Milan-based fashion label Off-White four years ago, passed around different sneaker prototypes, then shared photographs of concepts for his new millennial-focused furniture collaboration with Ikea. “Surreal” was his initial reaction to being approached by the Swedish chain. Sitting in the front row, Lanisha Blount, who graduated from the Graduate School of Design in May, was rapt. Abloh, who has a master’s degree in architecture from Illinois Institute of Technology, was nominated in 2011 for a Grammy for art direction for his work on the Jay Z-Kanye West album “Watch the Throne.” Diana, Princess of Wales, served as inspiration for his most recent Off-White runway show, with cocktail dresses and clutches made from tabloid media logos. Chicago’s Museum of Contemporary Art is planning a retrospective of Abloh’s work for 2019. “He’s unafraid to deconstruct his ideology in the public arena,” said Oana Stanescu, a design critic in architecture at GSD and co-founder of the New York-based firm Family, who in her introduction recalled designing Off-White’s Hong Kong store with Abloh exclusively via text message. Abloh said he’s been inspired by the work of Rem Koolhaas, Donald Judd, Jim Joe, and many others. “I have mentors who are dead. I have mentors 30 years older than me. 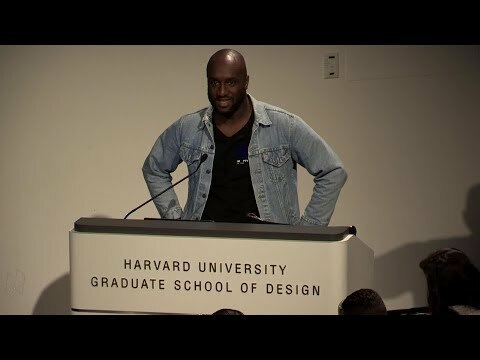 I have mentors 10 years younger,” Abloh said, before ending the lecture with a new title, “Insert Yourself Here,” and giving homework. Answering questions from President Faust onstage at Sanders Theatre, Wynton Marsalis revisited themes from past Harvard conversations.